After spending the afternoon making a batch of Williams Sonoma's chewy chocolate chip cookies for my boyfriend (to date, I have never made a batch of chocolate chip cookies that he thinks is perfect, and I'm sad to say that though I came close today, it was sadly still not quite how he likes them), I was exhausted from all the stirring and beating. It's tough work trying to cream butter and sugar without an electric beater! Anyway, I was in no mood to roll up my sleeves and cook dinner from scratch after baking, so dinner had to be minimal work. 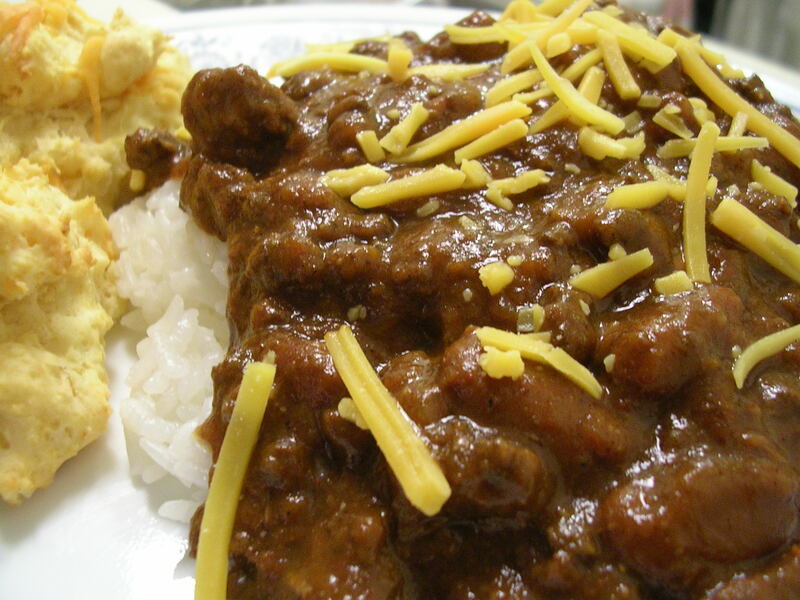 Luckily for me, my boyfriend had brought back a container of homemade chili from his house recently, and it was plenty for two people to eat for dinner, so we put some rice in the ricecooker, content to know that dinner would be easy. So the biscuits. It has sort of been an inside joke for nearly two years now, but a long while back Greg promised me he would make me biscuits one day, after I worked hard to earn it. Well, he hemmed and hawed, and has been delaying it for over a year, claiming that there wasn't time to get the necessary ingredients. Well during a grocery shopping trip last week, I brought up the biscuits, and he picked up a package of garlic cheese flavored instant biscuit mix from Bisquik (it was another one of those "just add water" mixes, which made me wary), proudly claiming that now he would be able to make biscuits. So with tonight being lazy chili night, we thought it was time to break out the easy biscuit mix, and so he stirred it up with some added minced garlic and cheddar cheese. It only needed to bake for about 15 minutes, and then it was ready to serve with dinner. Considering that these biscuits were made from a pouch and only had water added to the powder, they came out tasting reasonably good. The additional minced garlic and actual cheese helped enhance the flavors, but I was satisfied with the crispy outer layer of the biscuits. The interiors were soft and moist, but a bit too soggy for my preference. 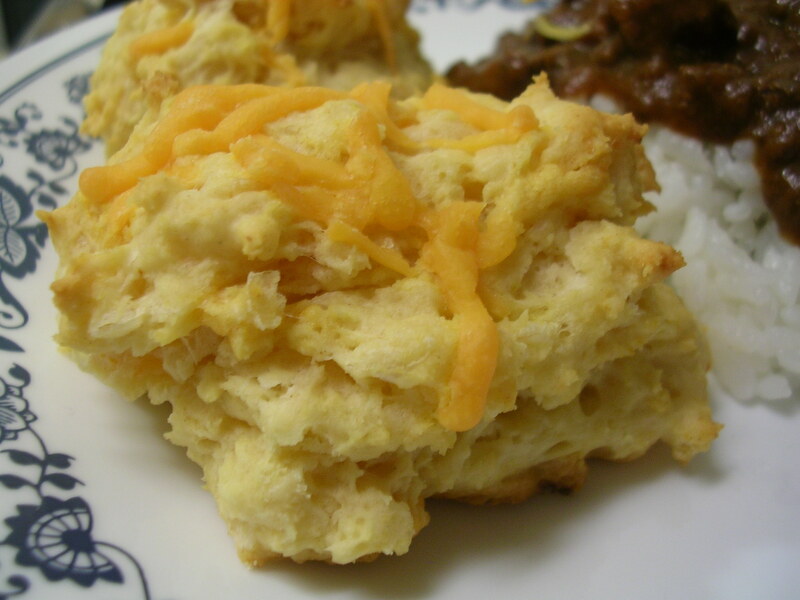 Greg thinks they are just the way biscuits are supposed to be (based on his experience with KFC biscuits…), and I haven't had too many biscuits in my life so I can't really say, but I thought that the centers were normally a little less soggy. I was almost kind of worried that the centers of these biscuits were undercooked. But after letting them cool down the centers dried off a bit, and tasted more like what I expected biscuits to be like. In any case, while the flavor was not out of this world, the texture helped make it a good contrast as a side to the rice and chili. The chili itself was quite good, with a mild kick that I found enjoyable. It had a strong barbeque sauce flavor, and was not as tomato-y as other chilis tend to be, which I didn't mind, since I like my dishes a little on the sweet side. The beans and meat were cooked to a nice softness though, and was great with rice. It would have been too salty to eat on its own as a normal bowl of chili, but I think the purpose was to eat it with rice, at least that was how it was intended when it was made at Greg's house. I would have liked to have topped the chili with some freshly chopped onions, but we only had shredded cheese on hand, so I threw a little bit on top. The meal came together quite well though, with minimal effort expended, which is always nice. 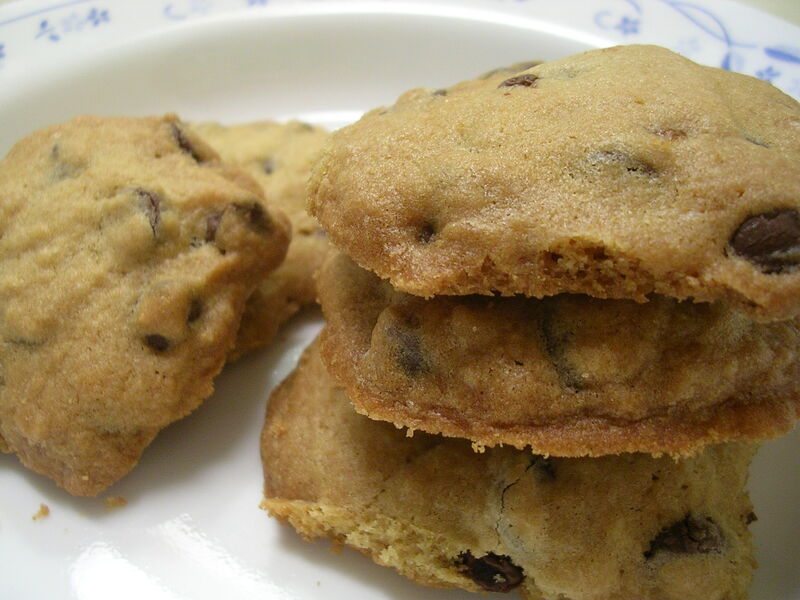 This entry was posted on Sunday, January 13th, 2008 at 6:44 am	and posted in American, baking, cooking, desserts, Uncategorized. You can follow any responses to this entry through the RSS 2.0 feed.